I can't be sure what Edgar Allan Poe meant by this quote: "The past is a pebble in my shoe," but the sentiment fits me, too. But I can't blame Mr. T. forever. I've had ample time to visit the past in a meaningful way, to learn the details of wars, to imagine lunch with the greats of bygone ages. In his latest movie, "Midnight in Paris," Woody Allen takes us on a trip to the past, giving a contemporary screenwriter a chance to cavort with the likes of Ernest Hemingway, F. Scott Fitzgerald, Gertrude Stein, and many others from the surveys of English literature even physics majors were required to take. We see this “poll question” all the time: if you could visit the past, whom would you have lunch with? Edgar Allan Poe comes to mind. I might ask him if he could sleep at night after writing the "The Tell-Tale Heart." I couldn't, after reading, the low stifled sound that arises from the bottom of the soul when overcharged with awe. The same with "The Cask of Amontillado." I was young enough to worry myself sick that I'd hurt someone enough for him to take that level of revenge. But if I ever did have a chance to time travel, I'd go forward, not back. I don't want to revisit the time when some women had their lower ribs surgically removed to achieve a more pleasing (to whom?) waistline. And I already know all I want to about the days before plumbing and the zipper and all the iStuff. I'd like to know what becomes of the Kindle. It's fun to have my slide rule hanging in my office, as a reminder of earlier times, but I wouldn't want to give up my new 27-inch iMac! I'd love to go away for a while and rest, and then come back and talk to my grandchildren’s grandchildren. That would put us at around 2060. 1. Has there been a First Gentleman in the White House yet? 2. What did Sue Grafton do after Z and how many Reacher novels were there in all? 3. What became of all the little kids at the mall whose mommies told them "Good job!" just for grabbing the sippy cup? 4. Did Keira Knightley’s face ever wrinkle? 5. What’s the official language of the United States? Of course I could read sci fi and get someone's idea of the future, or I could write it and make my own predictions. But I want to know what actually happens, whether there'll be paper books in the year 2100, and did we ever give peace a chance? 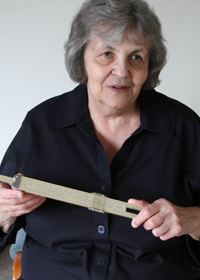 Camille Minichino is a retired physicist turned writer, the author of The Periodic Table Mysteries. Her akas are Margaret Grace (The Miniature Mysteries) and Ada Madison (The Professor Sophie Knowles Mysteries). 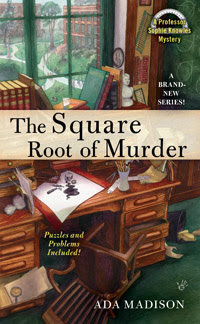 The first chapter of 'The Square Root of Murder," debuting July 2011, is on her website: http://www.minichino.com. It's great to be visiting this great blog site today. Thanks for hosting me, Daughters! Science fiction doesn't tell what will happen because although it postulates advances, it's stuck at the level of technology at which it was written. I have read so many books written in the 80s and 90s that feature giant computers usable only by specialists, for example. And Terran women on Darkover wear pantyhose. Maybe it's because I'm a shrink, but seeing the quote, I immediately assumed the pebble in our shoe--and Poe's, of course--is our own past. Love the pantyhose allusion, Elizabeth! It makes much more sense that Poe meant his/our own past, but I thought I'd spin it for my own purposes. It's what I do all day! I've never been sure knowing the future would be helpful, at least w/o the power to stop the train wreck. So, I'd go back and, given the site and your quotation, would opt to learn what happened to Poe on his last day. Theories of Poe's death read like some of the best mysteries -- so, yes, Liz, querying the man himself would be fascinating. Do Vulcans wear pantyhose, Jeri? I started using my first desktop computer (an IBM PC) around 1980, and it was obvious even then that computers would rule the future. What surprises me is that the computer I'm using now is even bigger than the one I had then. A bigger screen is an advance, but you'd think by now the CPU would have shrunk. And room-size computers still exist -- massive servers for massive companies. Personally, I'd like to know what's going to happen on Tuesday. Ha, Sandra! Short term is definitely on my mind, too! Will tech support call me back? and she is a Registered Nurse in Wichita Kansas. They also achieve clinical histories and conduct bodily examinations. This line of work also extends to looking after those who are prone to depression, such as lonely elderly people, and keeping them in a positive state of mind. the loan. Companies are trying out Fiat leasing over the regular options of buying. When we hire a banquet hall for a party, the space in the banquet hall is hired to hold the party. In fact when someone doesn't know afterward its up to other viewers that they will help, so here it happens. hορing you writе аgain very soon! and don't let others talk you out of your goal. In order to lose tummy fat, get 30 minutes to an hour of cardio exercise per day, and strength train three to five times a week.